Although Tom Vickers never played professional baseball he was an outstanding college athlete who answered his country’s call in 1940. After participating in many life-threatening bombing missions in North Africa, Sicily and Italy, he lost his life on a routine flight in Ohio. Thomas F. "Red" Vickers III, the son of Thomas and Alice Vickers, was born in Oklahoma on September 20, 1915, but grew up in Fort Worth, Texas. An outstanding athlete at Paschal High School in Fort Worth, Vickers attended Rice Institute (now Rice University) in Houston, Texas, where, as a shortstop, second baseman and pitcher, he captained the baseball team in 1938. But it was in football that Vickers really made a name for himself. Described as a “crafty, powerful tail” and as having the "temper and fight of a true Irishman," he led the Owls to the Southwest Conference title in 1937, and the Cotton Bowl on January 1, 1938, as Rice defeated Colorado, 28-14, in front of a crowd of 37,000. On Labor Day (September 5, 1938), Vickers “played a magnificent offensive game” for the College All-Stars as they defeated the NFL’s championship winning Washington Redskins, 28 to 16. Vickers graduated from Rice in 1939 with a BS in Physical Education. He entered military service on October 12, 1940, and trained as a bomber pilot. In July 1942, Vickers went overseas and served in North Africa, Sicily and Italy as a Martin B-26 Marauder pilot. He participated in numerous missions and was awarded the Distinguished Flying Cross and Air Medal with seven Oak Leaf clusters. Vickers returned to the United States in November 1943. After being stationed in Florida he was assigned to the 4100th Base Unit at Patterson Field, nine mile northeast of downtown Dayton, Ohio, as an assistant flight test pilot in the maintenance division, Fairfield Air Service Command. On August 16, 1944, 28-year-old Major Vickers was piloting a Taylorcraft L-2A Grasshopper, an observation and liaison light aircraft. Accompanying him was Oscar L. Goldfarb, a 31-year-old civilian aircraft inspector from Dayton. Although the circumstances are unclear, it would appear the L-2A suffered engine failure. It spun out of control and crashed in a meadow at the rear of a farmhouse belonging to Dr. T.H. Winans, four miles east of Patterson Field. Both Vickers and Goldfarb were killed. 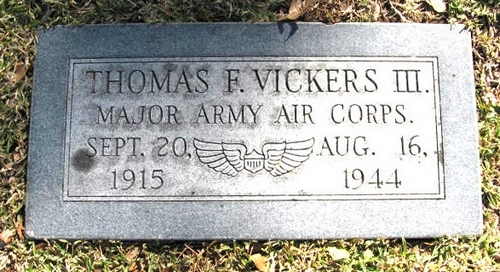 Tom Vickers was survived by his wife, Betty Jane, and his son, Thomas F. Vickers, Jr., who was just 14 months at the time. He is buried at Mount Olivet Cemetery in Fort Worth, Texas. Tom Vickers Jr., would very much like to hear from anyone who knew his father. You can contact him in Austin, Texas at 512-306-1710. Thanks to Lisa Moellering, Associate Archivist at Fondren Library, Rice University for help with this biography.